I’m back and my bear pack (have we decided on what a group of bears is called? Pack doesn’t seem right) has grown bigger! 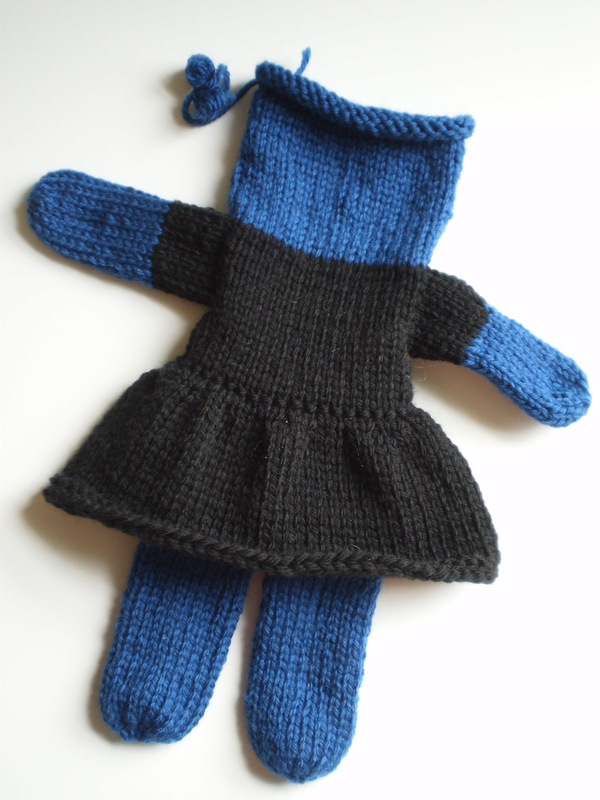 My newest bear is an adorable little blue teddy with a little black dress on! To be honest, I decided on this color scheme when I looked in the bottom of my bag and found that I had nearly-full skeins of both blue and black, and thought “How can I use up these colors quickly?” But, in the end, I kind of like her goth-chick vibe. She just needs a red scarf and an anarchy symbol embroidered on her chest. But that might be slightly inappropriate for this kind of project. Have any of you made skirts or dresses for your bears yet? This is my first beskirtted bear (beskirtted is a word because I say it is), and I’m not sure how much I liked making the skirt part. Don’t get me wrong, I like the finished product- the little, slightly ruffly skirt is adorable. But, the skirt felt like it took forever to knit up, and used up quite a bit of yarn, and if you’re using up odd bits and bobs of leftover yarn, I could see a skirt being fairly impractical. Of course, we knitters aren’t known for being 100% practical. I’ll probably do more beskirtted bears, maybe just not right away. If you haven’t started making Mother Bears, take a minute to look at the project website, and consider giving it a go! Have you done any skirts on your bears? How did they go? What’s your bear total so far? This entry was posted in Knitalong and tagged bear, charity, charity knitting, christmas, knitalong, knitting, mother bear, mother bear project, skirt, teddy bear on November 9, 2015 by onemilljellybeans. I am embarrassed to say that I haven’t finished my first bear yet, but I am really pleased with how it is turning out so far. My bear is wearing jeans.